While it remains uncertain if the S&P 500 Index December 10 low at 2583.23 will hold, the SPDR S&P 500 ETF (SPY) put spread suggested in Digest Issue 49 "Technical Damage [Charts]" stays in place just in case. Should, it hold and quickly rebound look for serious resistance at 2800. In the unlikely event it manages to advance and close above 2800 between now and year-end watch for the development of a Triple Bottom pattern described below the market review. S&P 500 Index (SPX) 2599.95 made another leg down closing 33.13 points or -1.26% lower last week with the largest and most important decline of 50.59 points occurring Friday, led lower by JNJ, COST and ADBE in a mad year-end dash for the exit. 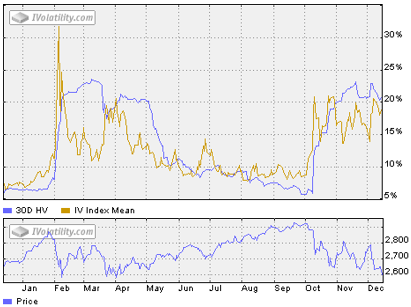 CBOE Volatility Index® (VIX) 21.63 declined 1.60 points or -6.89% last week. Our similar IVolatility Implied Volatility Index Mean, IVXM using four at-the-money options for each expiration period along with our proprietary technique that includes the delta and vega of each option, declined 1.74 points or -8.46% last week ending at 18.83. The one-year volatility and SPX line charts follow. Back below 20 on a day when the SPX delcined more than 50 points, this does not look like a capitulation bottom – more like a range than a spike up typical at market bottoms, so either a bottom has been made or it's yet to come. With 2 trading days until December expiration, the day-weighted premium between December and January allocated 10% to December and 90% to January for a -2.91% premium vs. -10.06% last week ending December 7. Still in the caution area, well below the bottom of the green zone between 10% to 20%. 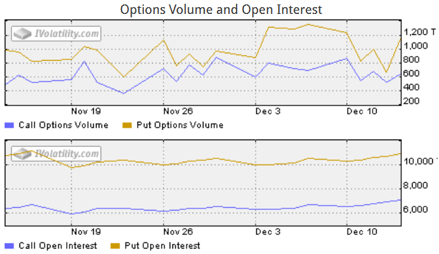 Friday's SPX option volume and open interest suggests either declining put volume was interrupted by unusual one-day selling or there is more to come as it capitulates. With AAII pessimistic sentiment at the highest level in 5 years and while hedged against a further decline, perhaps some consideration should also be given to the upside. From Edwards and Magee, Technical Analysis of Stock Trends, 5th Revised Edition, p.137, here are some thoughts. "Triple bottoms are simply Triple Tops turned upside down, with the same qualifications we noted when we were discussing Double Bottoms. The third low should always be attended by small volume, and the rise there from must show as decided increase in turnover and carry prices decisively above the top of the rallies that formed between the bottoms. One is never justified in 'jumping the gun' on a presumed Triple Bottom unless nearly every other chart in the book is in an unmistakably bullish position. ...uncompleted 'possible' Triple Bottom chart picture must be regarded as treacherous. Stick to the breakout rule and you will be safe." Although unlikely before year-end, it takes a close above 2800 to activate a Triple Bottom. Correction or Bear Market? While a bullish bias has been wrong since the early days of the current decline, until it declines below the February 9 low of 2532.69, it's premature to call it a bear market. Collar individual long positions (sell calls and buy puts) and hedge portfolio risk with index put spreads like the SPDR S&P 500 ETF (SPY) suggestion last week in Digest Issue 49 "Technical Damage [Charts]." Can the S&P 500 Index hold the December 10 low at 2583.23? Comments after Wednesday' s FOMC meeting will play an important role in shaping the outcome. 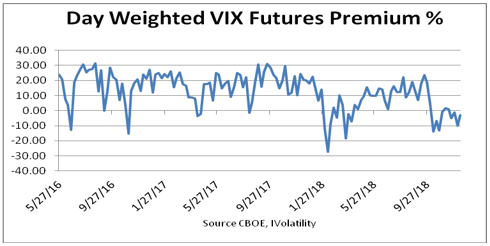 While the VIX futures premium indicator remains negative, others suggest it could go either way. In the meanwhile, continue hedging against any additional downside risk. Since the next two Mondays are the day before Christmas and New Year's Eve the next Digest will be January 7th.